Home » General » Announcement – set.a.light 3D V2.0 is coming! Announcement – set.a.light 3D V2.0 is coming! Our new set.a.light 3D V2.0 software is expected to be released in spring of 2018. It contains lots of brandnew features and a completely new light-engine. For lots of you it’s a helpful software, for us it is our baby. Many extensions and patches have been released in our free upgrades since 2012, but we of course want to go one step further. The wheel has to keep spinning. Our new Version (V2.0) takes a huge step into the right direction, all of our commitment flowed into developing this project. We’re doing that in order to be able to offer all of our many customers something new and extraordinary – it’s the best thing that we’ve ever developed. Thousands of hours of hard work and many sleepless nights were put into the creation of our new light simulation and the dozens of new features that set.a.light 3D V2.0 has to offer – and we really mean that! We’ve listened to you guys and we’re sure, that all of you will love the new functions. We promise: You’ll be excited and fascinated. Even more realistic results, more possbilities, more flexibility and a higher amount of efficiency in your work! And whilst set.a.light 3D still is a product without any competitors, the new V2 is an absolute world premiere! More intuitive workflow with optimized UI, better light-engine… – all of that is just a piece of cake for our V2. And you finally want to have fully movable models? – No problem. set.a.light 3D V2.0 is coming! Changing the color temperature in kelvin? Yep, that works. With our adjustable and completely movable models you can now create your own poses and save them. After that, you might want to change the model’s make-up and you’ll come very very close to your final image whilst still working at your computer and haven’t even started the shooting yet. This gets even easier with our new interior packages and new furniture! And a big wish of lots of members in our community is getting real: We’ve managed to implement continous/permanent light into set.a.light 3D V2.0! The best thing about that: You can now use permanent light and flash at the same time. In the next weeks we’re going to inform about all of the V2’s new features and functions on our different channels (Blog, Facebook, Instagram, …). Make sure to check them out regularly and be prepared for some awesome content and great news! New customers: Buy set.a.light 3D now and get our V2.0 for free! Who buys the actual version now or bought it since the 1st of November 2017 is able to receive the upgrade onto V2.0 for free. The V2 will be a bit higher in terms of price than the actaul version, so you’re able to save some money here! Existing customers: Cheaper pre-order for upgrade! 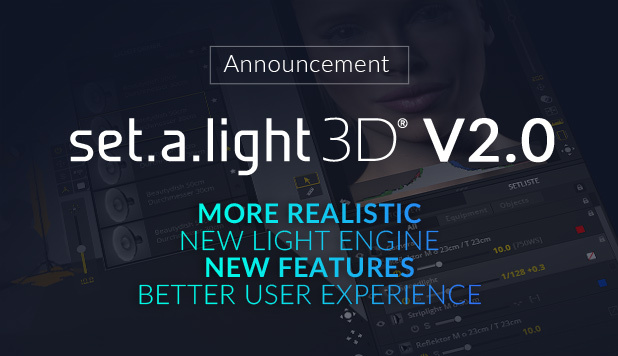 Our present to all of you: set.a.light 3D V2.0 is the first non-free upgrade since 2012 – and that’s why we have a special deal for all of our users. Soon, the pre-order for the upgrade is going to start. Whoever buys the access to our V2 here, will get the upgrade at a special price! This offer will ONLY be available via e-mail, so make sure to look out for mails or enter our newsletter. We’ll of course keep you updated! A list of all of the features of V2.0 can be found HERE! That article is getting expanded every time a new feature is released, so be sure to come back there every now and then. But this is also the moment for us to say “THANK YOU”! Many of you have traced the paths of set.a.light 3D and elixxier software for years! We’re always happy to see your results or screenshots of your work with set.a.light. The praise and fair ciritcs that we get from you make us work even harder and keep developing until we reach our goals. You’re great – THANK YOU! Our V2.0 contains everything the modern photographer needs – and so much more! If you have any questions, feel free to contact us via Facebook & Co. or via phone or mail! Previous: 7 tips – learn reading pictures the right way! Next: Huge package: 30 light setups bundle for you! How much will cost of the upgrade to v 2.0? I’m waiting and excited by new features! The prices are not fixed yet. We will publish more information soon. Do you have any information of how the features will be split up in the new version? I just bought the basic version as a way to extend my trial Before deciding on which version I should get. And since I am guessing new owners of the basic version will get the basic version of v2 it would help me decide if I should upgrade to studio now or wait for more info. Yes, there will be further restrictions on new features. I highly recommend the STUDIO version. The price-performance ratio is very very good! I use the studio version for all my shootings and workshop. But I am french and I hope one day Set a Light will be realized in french too.